Rabs boss Stewart Maxwell admitted his Super League table toppers were far form at their best against their Ayrshire District League opponents. But they did enough to get through the tie which was switched to Ardrossan after ground conditions at Guy’s Meadow put the game in doubt. The first chance of the match fell to Rob Roy when Chris Duff crossed for Gary McMenamin but the Rabs skipper was well wide with his effort. There was little between the sides in the early stages with Rabs keeper Michael McKinven doing well to save a Ryan Caddis goalbound volley with his feet in the 14th minute. 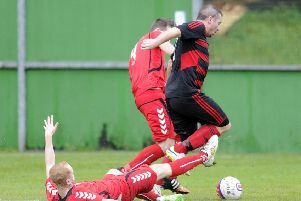 As the half wore on Rob Roy looked the more likely to score. Gavin Mackie’s 20 yard free-kick was headed on by David Barr and taken from under his crossbar by Rovers keeper John Mullen. However Rabs did break the deadlock in the 25th minute when Duff’s shot from inside the penalty box was deflected past Mullen. The Ayrshire District League leaders were dangerous on the break, with experienced captain Ryan Caddis proving a handful to the Rob Roy defence, and on the half-time whistle Bobby Colligan brought out a quality save from McKinven. Rovers came out for the second half seeking the equaliser and Caddis sent a free-kick over the bar before the home side levelled matters in the 54th minute. The ball fell to substitute David McNeil and he took it under control before sending it past McKinven. Rabs responded with a spell of pressure which saw a Lee Gallacher shot blocked and a Mackie drive pushed over the bar by Mullen. A minute later the keeper was again in action this time, saving a Kevin Watt header. Rabs were making chances but were unable to beat home keeper Mullen who was having an outstanding match, making further saves from Watt and Gallacher. As Rovers then began to push forward a Ross Kearns header was cleared, then Caddis had a good effort kicked off the Rabs goal-line. In the dying minutes Rob Roy could have won it when Kevin Green was given space at the back post but he sent his free header, from a Gallacher corner, over the bar. Another chance to win outright was squandered and the match was now destined for a penalty kick shoot-out. Both sides missed their opening penalties - Regan Ross for Rovers and Green for Rabs - before scoring their next four. Steven Tan, Michael Lennox, Marc Davidson and Ryan Caddis all netted for Rovers with Duff, Gallacher, Watt and Reece Pearson countering for Rabs. That sent the decider into sudden death situation and McKinven made a superb high save from Dylan Caddis, leaving skipper Gary McMenamin to step up and confidently send the ball low into the corner of the Rovers net to make it 5-4 in Rabs favour and take them into the next round, despite an uninspiring performance.